I always struggle with talking about science, especially to the lay audience. It’s something I actually want to perfect. So, what better than to bring up the research closest to my heart? When I say heart there, I really mean my thesis project. Practically the same thing at this point in time! Before entering Mark Wilson’s lab at University of Nebraska-Lincoln, the lab published a paper called “Structural impact of three parkinsonism-associated missense mutations on human DJ-1” in the journal Biochemistry back in 2008. If you are really curious and want to read the paper in it’s entirety, which I recommend because, quite frankly, it’s a great paper, you can go here. When DJ-1, a small conserved protein of 189 amino acids, is absent or genetically mutated thereby making the protein inactive, humans get Parkinsonism. Parkinsonism differs from Parkinson’s disease in semantics only, really. You see, you can’t be diagnosed with Parkinson’s disease (henceforth called PD) until autopsy. 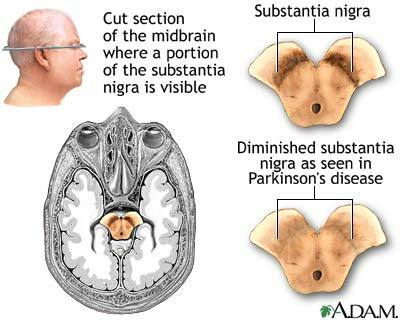 At this stage, they will look in specific regions of your brain for some hallmarks of PD (such as loss of dopaminergic neurons in the region of your midbrain called the Substantia Nigra pars compacta). It always helps to illustrate what this all means in science. So, here are a few very neat pictures. I work in a lab that visualizes proteins by means of X-ray Crystallography. So, the model representation of the structure I showed above was solved by my lab! Pretty nifty, right? 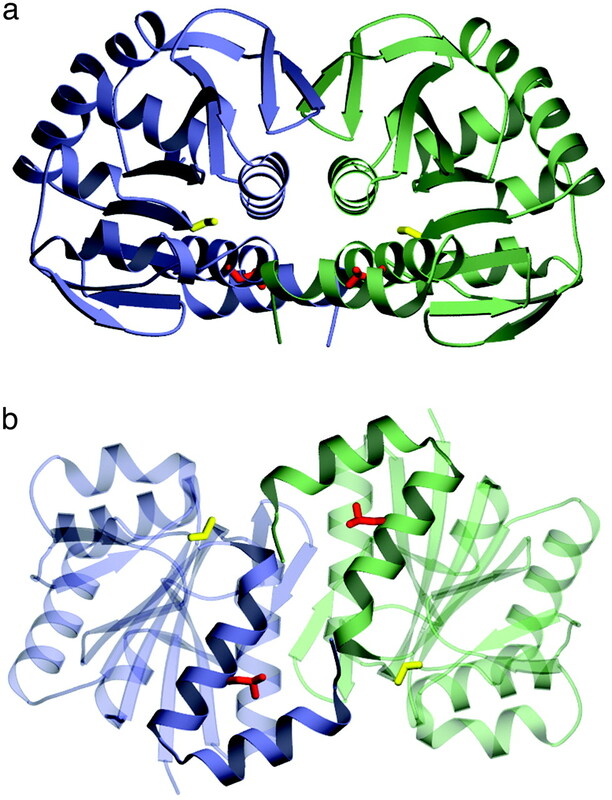 Several mutations in DJ-1 have been implicated in Parkinsonism in humans. One of these mutations has been extensively studied and is called L166P, meaning in the normal, or wild-type, DJ-1 protein, we see a leucine at position 166 and in the Parkinsonism-associated version of the same protein, this leucine is mutated to a proline. This amino acid can be found in the above DJ-1 structure as a red stick figure in the “smile”. In technical terms, this mutation lies on the dimer interface, and when it’s mutated, it disrupts the ability of DJ-1 to form the dimer, which causes the protein to just unravel. When it’s unraveled, it can’t protect the cells anymore, and you present with Parkinsonism. What this boils down to is this: you don’t want this mutation. It’s bad news. This paper really starts looking at some other mutations that are known to cause Parkinsonism, and they are A104T, E163K, and M26I. Again, the first letter in each of these instances is what should be there to have a normal protein, but alas, they are mutated to the second letter in an abnormal protein. What did this paper find out about these three mutants? First of all, that these mutations all reduce thermal stability of DJ-1 (meaning, it falls apart at lower temperatures), but the structure of each mutant (because that is what my lab does) barely changes at all! This is BIG news because the structure of L166P can’t be figured out by X-ray Crystallography because it’s a jumbled heap of a mess and has no structure to determine. Luckily, other methods (primarily NMR) has illustrated this nicely! So, now we have the normal protein and 3 mutations in that protein, and all 4 of these versions looks nearly identical. This basically sets up my thesis project, which aims to understand the mechanisms of action of some of these mutations. Basically, I’m trying to figure out why people get Parkinson’s disease. No big deal.